Fabbricatori di ghiaccio per bar, pescheria e ristorazione in genere. PRODUTTORE DI GHIACCIO IN CUBETTI CAVI cm32x50x64+4.5h DA PAVIMENTO SISTEMA A PALETTE PROD. 22Kg/24h DEPOSITO 4.9Kg MON. PRODUTTORE DI GHIACCIO IN CUBETTI PIENI cm32x50x64+4.5h DA PAVIMENTO SISTEMA A SPRUZZO PROD. 25Kg/24h DEPOSITO 9Kg MON. 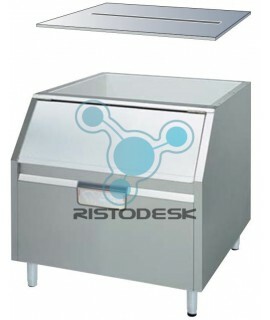 PRODUTTORE DI GHIACCIO IN SCAGLIE PIATTE cm87x55x60h DA APPOGGIO CON EVAPORATORE ORIZZ. PROD. 250Kg/24h SENZA DEPOSITO M.
PRODUTTORE DI GHIACCIO GRANULARE PRESSATO cm52.9x62.9x79.1+8.9h DA PAVIMENTO CON EVAPORATORE VERTIC. PROD. 85Kg/24h DEP. 25Kg M.
PRODUTTORE DI GHIACCIO IN CUBETTI CAVI cm32x50x64+4.5h DA PAVIMENTO SISTEMA A PALETTE PROD. 24Kg/24h DEPOSITO 4.9Kg MON.